As the buzzer announcing the end of the second period echoed throughout the University of Ottawa hockey rink, player number 18, sporting a ‘C’ on the chest of his red jersey, enthusiastically skated over to the gate leading to the home team changing room. Canada’s Chief of Defence Staff was in the midst of leading his team of General Officers and Flag Officers (known in the Realm of the Rinks as “the GOFOs”) to an 8–7 victory in a friendly afternoon match against the “Lame Ducks” — a team comprised of military attachés from various embassies in Ottawa. Without skipping a beat, Gen. Lawson transitioned from good-natured hockey chirping to discussing what he considered to be the highs and lows of 2014, some of the complex issues facing the Canadian military, as well as his thoughts on current operations against ISIS in the Middle East. 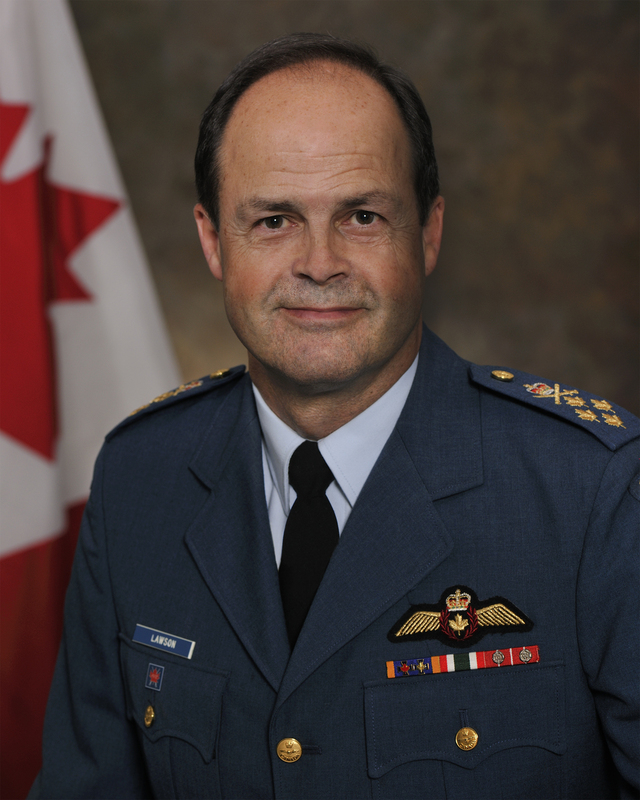 Gen. Lawson was appointed Chief of Defence Staff in late October 2012, adding to an impressive and varied career in the Royal Canadian Air Force. Even for a strong leader who has been trusted with trying tasks in the past — such as being named the spokesperson of the Canadian military during the air campaign to oust former Libyan dictator Moammar Gadhafi in 2011 and taking the lead on the troubled F-35 procurement file — 2014 certainly had its challenges. In addition to trying to maintain operational readiness and capability in the face of federally mandated defence budget cuts to the tune of $2.1 billion, the Canadian Armed Forces has been working through complex personnel issues that can’t simply be fixed with the signing of a cheque, or bolstered training. The year 2014 opened with a heartbreaking string of soldier suicides. Statistics released later in the year showed that the Canadian Armed Forces lost more personnel to suicide (160 soldiers) between 2004 and March 2014 than from the entire 12-year combat mission in Afghanistan (138 soldiers). Federal opposition parties, advocacy groups, soldiers, families, and veterans have been increasingly vocal in demanding that more support be offered to personnel and veterans suffering from the mental injuries that can be caused by combat. From across the country, there has been a panicked plea that the Canadian Armed Forces get a better handle on how to prevent soldier suicides. The department of Veterans Affairs Canada has been under heavy criticism in the past year for shuttering regional offices across the country, a perceived lack of duty or caring for injured veterans — particularly as a result of the New Veterans Charter — and for more than $1 billion in lapsed funding during the past several years. Minister of Veterans Affairs Julian Fantino was replaced by retired Royal Canadian Air Force officer and Conservative MP Erin O’Toole on December 5, after months of fervent demands that he step down. A Statistics Canada survey released in August 2014 found that one in 13 full-time female members have experienced sexual assault as a direct result of their service. There has also been discussion this year about the Canadian Armed Forces’ difficulty in recruiting and retaining members. A report drafted by the Department of National Defence, and tabled in the House of Commons, stated there was a shortfall of almost 900 full-time members and 4,500 reservists in the CAF. When asked what the cause of this deficit was, Gen. Lawson says that a surge of recruiting efforts in the early 2000s, with retention rates remaining high because of Canada’s faltering economy, made the military an extremely secure and attractive employment option. He said that recruiting centres are busy, but that the military needs to find a way to process prospective members more quickly. A CF-18 pilot outside his cockpit during Operation IMPACT in Iraq. Gen. Lawson also discussed Canada’s part in the ongoing allied air mission against the Islamic State of Iraq and the Levant (ISIL/ISIS) terrorist group. Questions have been raised about how effective the air strikes have really been, considering that there are limited ways to confirm whether the attacks have disabled ISIS in any way, or whether or not any civilians have been harmed. Some of the most notable targets that have been hit to date are a roadside stop, construction equipment, and a possible munitions warehouse. Lawson insists that the CAF is “absolutely” declaring some level of success so far in the battle against ISIS. “I think it’s fair to say that we figured ISIS would become a lot less coalesced,” says Gen. Lawson. “So the targets would be harder and harder to find as soon as we were successful in blunting their attacks. And that’s what we’ve done,” he explains. He admitted it is a “very tough” mission to accomplish from the air, but the Iraqi soldiers have been brought to the level where they can now put pressure on ISIS from the ground, and Canada’s air strength can be partnered with ground operations. As the Iraqi military identifies pockets to target, Canada can help smother them, he said. The fear caused by ISIS this year through its publicized beheadings of Western hostages in the Middle East and the havoc it’s wreaking there has catapulted it into the levels of the ultimate global villain. A string of tragic attacks in Canada and other Western countries this year have been (whether justifiably, or not) linked to ISIS, and labelled as domestic terrorism inspired by Islamic extremist beliefs championed by the group. Canada’s own brush with these attacks happened the week of October 20, when Warrant Officer Patrice Vincent was intentionally run over in the parking lot of a Canadian Armed Forces recruitment office in Saint-Jean-sur-Richelieu, Quebec, and killed. Two days later, on October 22, Corporal Nathan Cirillo was gunned down while standing guard at the National War Memorial in Ottawa. Both perpetrators were labelled as homegrown Islamic extremists. The events of that week were strongly connected to what Gen. Lawson identified as his highest and lowest points in 2014. In an effort to wrap up the interview on a positive note, and to put the General back on the ice in the same upbeat mood in which he stepped off, he was asked a series of light, rapid-fire personal questions. Oh, and the third period was well underway at this point, with the interview running very generously into its twelfth minute.